서울의 기후는 남부지방의 난대성 기후와 북부지방의 냉대성 기후의 중간적 성격을 나타내어 비교적 사계절이 뚜렷하고연 간 기온과 강수량의 차가 크게 나타난다. 서울의 기온과 강수량은 1910년과 비교하여 증가하였는데, 연평균 기온은 1910년 섭씨 10.3도에서 2012년 현재 섭씨 12.2도, 강수량은 1910년 1,021㎜에서 2012년 현재 1,646㎜로 증가하였다. 2012년 4월 기준 서울시 계절별 평균기온은 도심지로 갈수록 높고 교외로 갈수록 낮게 나타나고 있다. 이러한 고온지역의 분포는 도시 열섬효과의 결과이며, 고층건물 증가, 도로포장 증가, 녹지대 감소 등 토양피복 변화와 밀접한 관련이 있다. 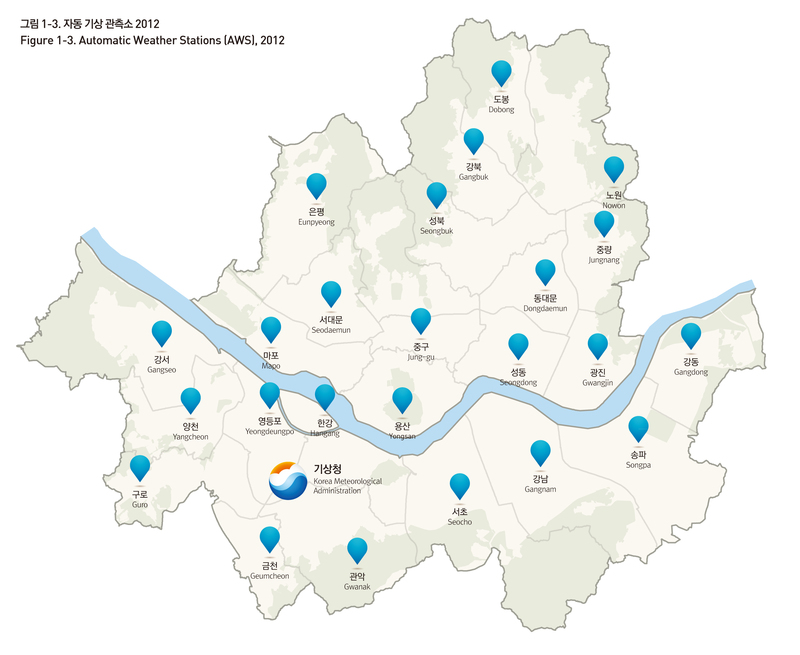 The climate of Seoul is halfway between the warm temperate climate of the southern regions and the microthermal climate of the northern regions, with four clearly distinguished seasons and strong discrepancies in temperature and rainfall throughout the year. The annual average temperature rose from 10.3°C in 1910 to 12.2°C as of 2012. Similarly, annual rainfall rose from 1,021㎜ in 1910 to 1,646㎜ in 2011.